3. Self-registration through the online Member or Team Registration Form. The default product will automatically show on the form when a player or team registers. 1. From the association level of Membership, click on Registrations in the menu and select Products from the drop-down menu. 2. Scroll down the bottom to 'Default Registration Product'. There are two drop-down lists - one for a default 'member' product and one for a default 'team' product. From the appropriate drop-down list (Member or Team), select the product that you want to make the default (compulsory) product for new registrations. 3. Click on Update to save the settings. Below is an example of how the default product would appear on a member registration form. 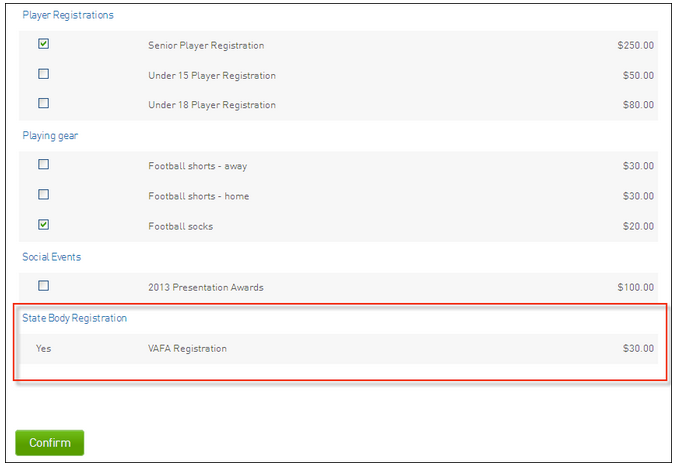 You will notice that the default product (VAFA Registration) is pre-selected for that new registration and it cannot be removed.